The Source marks the induction of my reading endeavors with author Luthaneal Adams at the helm. I never hesitate to take on authors I’ve had no prior exposure to before. Always looking for a fresh style, innovative prose and creative outlook, Adams manages to deliver the triple crown in this ground breaking first volume in the series. A premise of ancient evil unleashed is intriguing albeit far from new in the realm of horror story telling. On the same token it is refreshing to see fresh content that isn’t dipping in the over saturated topics of other horror novels out today. The author manages to take an ancient idea, put a fresh spin on it and entice a most thought-provoking process unto a legion of readers. 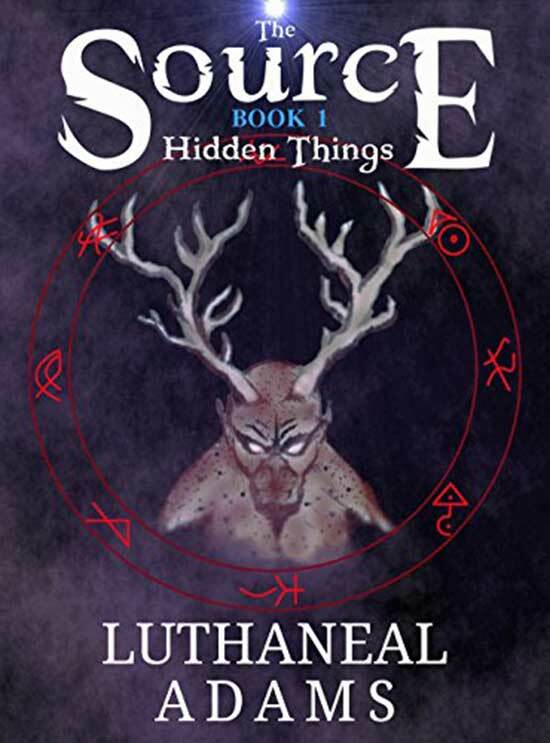 Luthaneal’s prose is articulate, uniquely stylish and poetic. At first the words come in a flourish that would suggest a sophisticated European decent. However, the reading audience is spared of alienation trapped in realm of literary expression. Though not precisely commercial either, the author manages to find the balance somewhere in between. At the risk of appearing politically incorrect, The Source is executed and delivered in a real man’s man of horror story telling. Adams is unapologetic in his craft and I for one admire his efforts all the more for it. Perhaps what’s most noteworthy about The Source is each individual character’s story. His or her plight is obsession in origin all revolving around the ancient book. What truly sets this novel apart from other type stories is the fact each tale could easily be just as effective as a stand-alone story. And what really makes it ingenious is just how each intertwines with the next. The author manages to capture a wide myriad of emotions in his characters. In an almost seemingly effortless gesture he manages to get into the minds of the reading audience. Regardless of the walk of life in each protagonist we find ourselves being beckoned deep into the fray of empathy. We strive for the character to survive in vicarious hope that good will always prevail over evil. Exposition is rarely touched upon and when it does it contributes to the pace of the plot escalation rather than offer a deterrent of distraction. Adams appears to have a firm grasp on his market and an applied technique of what works and what does not. He keeps the characters in the moment with little room for sentiment or reflection, not at all an easy task when making the protagonists relatable. Yet its damned effective in this case. The subtext of ancient evil vs. contemporary evil accentuates the plot further. We, as the reading audience peel back the layers of what motivates the characters from within and how possession of the ancient book drives each with purpose. The Source is quite easily a tale that would translate effectively into a film adaptation if executed just right. The scenes are descriptive, engaging and keeps the readers in the moment in vivid grandiose. Forever anticipating more its no mystery now why The Source was labelled as Book One: Hidden Things. While ordinarily it irks me to no end when a book is released under the pretense of Book One. In other circumstances I feel it bludgeons the reader into embarking upon an extended journey that has a preconceived success prior to its release. However, in the case of The Source Adams’ confidence in a strong story is warranted and most welcomed. The dialogue is realistic, authentic and reflective of current societal interaction. We never second guess the realism of the characters and how each of the here and now protagonists relate to ancient antagonists’ verbal prose is spell binding if not morbidly humorous at times. The Source: Hidden Things is a most welcome and refreshing change from the norm. It isn’t often I eagerly anticipate a sequel with such enthusiasm. Best believe I will be one of the first in line for book number two.